Water quality is a major problem causing corrosion and mineral build-up. Using a food service quality water purifier with scale treatment will keep the 707u clean. The purified water will eliminate the white mineral dust that falls from the evaporating air and it removes odors and corrosives such as chlorine and sodium. Gap between impeller and motor needs adjustment. Motor corrosion from hard water. Not draining the 707 off season causes motor seizure. Impeller and Pump Cap clog. These photos show a 707u used in a humidor. The photo on the right shows the 707u motor assembly. 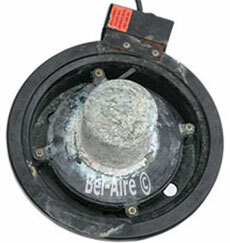 The motor still runs fine but the aluminum motor cap is heavily corroded from chlorine and has a heavy crust of lime. The humidor environment runs year round and at a much higher humidity than a residential home. When under such heavy usage the water quality is most important. These photos would be much different if distilled quality water was used. The centrifuge effect separates the once dissolved heavy minerals from the water. The very fine minerals create a slime. The slime leaves behind the dried residue in the 707 reservoir pan shown in photo. Test your water and consult with local experts on treatment. Food service quality filters are designed to keep the equipment clean while producing water free of bad taste or smell. Pure water is necessary for moist air with a clean taste and smell. Removing the chorine smell is important for a humidor. The filtration process of stripping the water of minerals can leave water acrid. The acrid water will cause corrosion. A simple combination filter will remove the minerals, remove the odors, and treat the water with a softener that corrects the high PH. Photo left shows the impeller pump clogged from the minerals. Removing the pump cap results in sediment falling out. This sediment caused un-balance. To clean the impeller, remove the pump cap. The cap is pressed-in and should simply pull-out. Run the cap under hot water if its stuck. 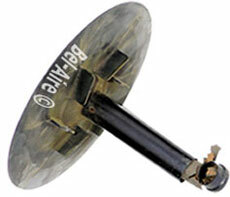 The unbalance caused the impeller to became loose. The setscrew appeared rusted but it was the brown mineral build-up. 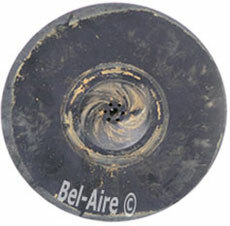 The impeller clearance from the base needs to be set to 1/16". The set screw was re-secure using a 1/16" allen wrench. The Photo on the left shows the top of the impeller. Minerals have been centrifugally separated from the water. Use a pipe cleaner to clean the 6 small holes. 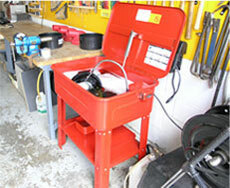 At Bel-Aire we use an automotive parts washer with humidifier cleaning detergent. 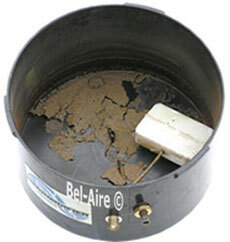 The re circulating pump cleans the most difficult humidifiers or electronic air cleaners.